UK CPI inflation soared for October by rising to 2.7% up from 2.2% (Sept) which is set against academic economists / mainstream press expectations for a rise to just 2.3%. Whilst the more recognised inflation measure, RPI rose to 3.2% up from 2.6%, against press expectations of 2.8%. Mervyn King, the Governor of the Bank of England had earlier this year forecast that UK inflation would continue falling into the end of this year which the mainstream press and academic economists had been busy regurgitating at length. However today's inflation data reasserts the actual Inflation mega-trend which is for Inflation to remain well above the Bank of England's target rate of 2%, with average CPI for 2012 expected to come in at a rate above the Bank of England's upper limit of 3%. The mainstream press headlines say it all (Google) of still not having a clue at all, after having missed three whole years of an inflation mega-trend in progress. The academics and pseudo economists are again bringing forward virtually every reason under the sun to explain why Inflation has risen, where this time it is apparently tuition fees and food inflation, which are ALWAYS said to be temporarily price rises. However what the most vocal commentators most consistently miss is that the primary driver for Inflation is the debt that the government has been busy printing to the tune of an additional £130 billion a year (budget deficit), which the countries central bank (Bank of England) has been busy monetizing by printing money that it channels to the banks to BUY government bonds that the government prints. When you print £130 billion per year you are pouring petrol onto the inflation fire, and when you monetize the debt by printing money then you are in effect pouring rocket fuel onto the inflation inferno as I covered at length in the in-depth analysis - 20 Jul 2012 - The Quantum of Quantitative Easing Inflation is Coming! of what is likely to transpire going forward and more importantly why. 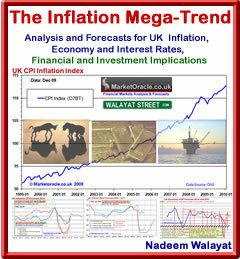 Whilst the mainstream press and academics focus WHOLLY on the annual CPI Inflation graphs as illustrated above, the reality is that of an exponential inflation mega-trend as illustrated by the below graph that shows that despite the British economy having been in economic depression for the past 4 years, yet it has still suffered inflation of over 15%. My expectations remain for UK inflation to average above the Bank of England's upper limit of 3% for the duration of this DECADE. My intention remains to generate a more detailed trend forecast for UK inflation for over the coming years ( i.e. as illustrated by past forecasts), which is also necessary in terms of resolving towards trend forecasts for the UK economy and markets such as the UK housing market, to get this on completion in your email in box ensure you remain subscribed to my always free newsletter. In the meantime the Bank of England continues the QQE fraud as I warned of several months ago (20 Jul 2012 - The Quantum of Quantitative Easing Inflation is Coming! ) that I will discuss in detail in my next in depth analysis as it does warrant a detailed look to dissect the debt monetization dynamics, in the meantime don't let yourselves become infected by mainstream press deflation delusions that will follow after the Bank of England's quarterly economic propaganda report due out tomorrow, because deflation has NEVER been imminent, nor will it be for the duration of this decade.